May 18, 2015. In an important development for the global maternal health community, the long-awaited Strategies toward Ending Preventable Maternal Mortality (EPMM) will be launched at the 68th World Health Assembly, at an event hosted by Cameroon and Malawi and co-sponsored by the contributors to the Every Newborn Action Plan. This event marks the culmination of over two years of consensus work and collaboration with multiple stakeholders that began in January 2013. The EPMM Working Group—led by the WHO in partnership with MHTF, UNICEF, UNFPA, USAID, Family Care International, Maternal Child Survival Program (MCSP), and White Ribbon Alliance—has stewarded the process to gather key inputs and consult widely with a broad range of stakeholders to develop the ambitious yet feasible targets for ending preventable maternal deaths within a generation, and to identify the strategic priorities and actions necessary for achieving this vision. The strategies are presented in full in the EPMM report that has been recently published by the World Health Organization. The EPMM targets were included as part of the Every Newborn Action Plan resolution at last year’s World Health Assembly. The EPMM targets and strategies are grounded in a human rights approach to maternal and newborn health, and focus attention on eliminating significant inequities that persist, resulting in disparities in access, quality, and outcomes of care within and between countries. The strategy emphasizes effective planning for high-functioning maternal health systems that are equipped to identify the immediate and underlying causes of maternal deaths and to develop evidence-informed, context-specific programme interventions to avert future deaths. 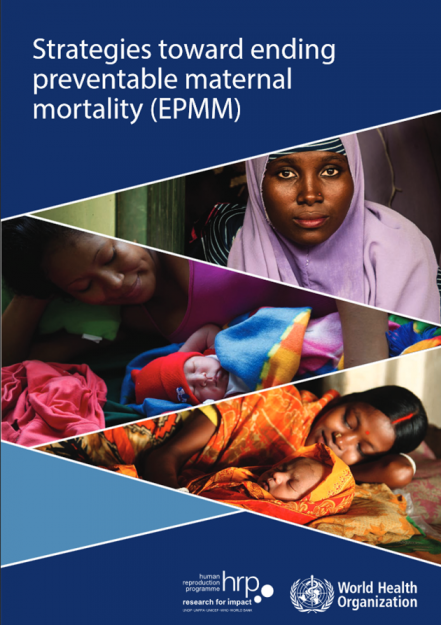 Both the EPMM and ENAP strategies informed the technical working paper, “Effective Interventions and Strategies for Ending Preventable Maternal and Newborn Mortality and Stillbirths,” which fed into the updated United Nations Secretary-General’s Global Strategy for Every Women’s, Children’s and Adolescent’s Health. This technical paper is slated to be published in the British Medical Journal as part of a series of papers that support the Secretary-General’s updated strategy. The “zero draft” of the full “Global Strategy 2.0” is currently open for public comment, through June 5, 2015. The EPMM Strategy will be launched in conjunction with the one-year anniversary of the passage of the Every Newborn Action Plan resolution and with it the launch of the ENAP Progress Report. To mark the occasion of these significant achievements, an event at the 68th World Health Assembly will showcase a combined strategic approach using the EPMM and ENAP frameworks to accelerate progress and feature examples from country champions of successful models of integration at national policy and point-of-service levels. Riva Jolivet is a maternal health consultant at the Maternal Health Task Force. This blog originally appeared on their website.